Celebrating the fortieth anniversary of the original Shelby Cobra GT500KR, Ford and Shelby collaborate on a new ‘King of the Road’ Mustang with the 2008 Shelby GT500KR. Shelby GT500KR features an estimated 540-hp 5.4-liter supercharged V-8 with a Ford Racing Power Upgrade Pack, 3.73:1 rear axle ratio, short-throw shifter, and unique suspension tuning. Exterior design draws inspiration from the classic Shelby KR Mustangs and features unique carbon composite hood, wheels, and special 40th Anniversary badging and unique striping. Shelby GT500KR arrives in spring 2008 in an exclusive run of only 1000 units. Forty years ago, at the 1967 New York Auto Show, Ford introduced the most powerful Shelby Mustang ever. Like every Mustang that bore the name ‘Shelby,’ the GT500KR carries with it its own unique story. The 1968 Shelby Cobra GT500KR was a mid-year introduction, based on the 1968 Shelby GT500. Ford added ‘Cobra’ to the Shelby’s moniker to help usher in the beginning of a new performance era at the company. The Cobra name referred to the new 428 Cobra Jet V-8 that was planted under the KR’s custom fiberglass hood. It was the engine that would once again vault the Mustang to the head of the pack. Since he had always wanted to use the name, and as one to never miss an opportunity, Shelby set his organization in gear, registering the name and designing new badging for the Cobra Jet-powered Mustang, christening it the GT500KR, and bringing Ford’s ‘King of the Road’ to market before GM ever got a chance to apply the name to their product. 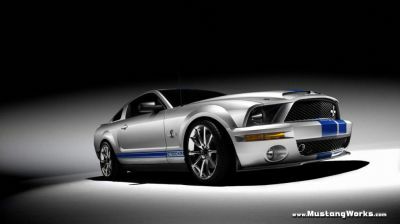 The modern Shelby Mustang line-up started with the 2007 Shelby GT500 coupe and convertible. With the recent launch of the 2007 Shelby GT, the 2008 Shelby GT500KR becomes the third production high-performance Mustang brought to market through the relationship of Shelby Automobiles and Ford. Ford and Shelby Automobiles also partnered up with Hertz to produce a special limited run of 500 Shelby GT-H “rent-a-racer” Mustangs available only for rent. The first 2007 Shelby GT500 available to the public sold for $600,000 dollars at the 2006 Barrett-Jackson Collector Car Auction in Scottsdale, AZ benefiting the Carroll Shelby Children’s Foundation. Shelby GT-H coupes auctioned off to Ford dealers after completion of Hertz rental duty consistently average $50,000, with high auction bids of $90,000. Gary Davis, vice president of production and product development for Shelby Automobiles, played a key role in defining the look of the custom designed carbon composite hood for the GT500KR. His knowledge of the original GT500KR helped sculpt a modern interpretation of the original’s bulging hood scoop, a visual indication of the extra horsepower packed beneath it. The hood is secured by a pair of stainless steel, twist-down hood pins. The composite front valance houses a pair of chrome-trimmed, functional brake ducts to cool the large 14-inch, vented Brembo front brakes. Just like its namesake, the 2008 ‘King of the Road’ packs a walloping dose of Ford performance power under its massive composite hood scoops. The Ford SVT-engineered 5.4-liter supercharged V-8 is treated to a Ford Racing Power Upgrade Pack that boosts horsepower to an estimated 540 and torque to 510 ft.-lbs., thanks to revised ignition and throttle calibration and a cold air intake system that replaces the stock unit. Power is delivered to the rear wheels through a Tremec TR6060 six-speed manual transmission and 3.73:1 rear axle ratio, upgraded from the standard GT500’s 3.31:1. Gear selection is courtesy of an all-new Ford Racing short-throw shifter making its debut on the KR. Topped with a white ball, the new shifter is 25 percent shorter than the unit on the GT500 providing for crisper, sharper shifts. Ford SVT, Ford Racing and Team Shelby worked together to develop the KR’s suspension tuning. Based on initial work by Ford Racing and the team at Shelby, often at Shelby’s own facility on the grounds of Las Vegas Motor Speedway, Ford SVT chassis engineers will apply fine tuning techniques to prepare it for the streets. Unwilling to wait for the impending pony car war to heat up, Ford is extending Mustang’s leadership position by feeding the enthusiast demand for more models, features, performance parts, and special editions. Ford has committed to at least one new Mustang ‘feature’ vehicle per year. For 2007, it is the Shelby GT, and for 2008, there will be at least two including the Shelby GT500KR and the previously announced Mustang Bullitt. Ford’s ‘Steed for Every Need’ strategy currently offers four horsepower options for Mustang, with pricing from $19,995 for a 240-hp V-6 Mustang coupe to $46,500 for a 500-hp Shelby GT500 convertible. Ford Motor Company, a global automotive industry leader based in Dearborn, Mich., manufactures or distributes automobiles in 200 markets across six continents. With more than 280,000 employees and more than 100 plants worldwide, the company’s core and affiliated automotive brands include Ford, Jaguar, Land Rover, Lincoln, Mercury, Volvo, Aston Martin and Mazda. The company provides financial services through Ford Motor Credit Company. For more information regarding Ford’s products, please visit www.fordvehicles.com. Now that’’s what I’’m talking about, but good luck getting one.